11:00 am – We pick you and your party up at your chosen location. Your time starts when we pick you up, no matter where that is. Your chauffeur arrives in a freshly cleaned, late model stretch limo or Party Bus, stocked with complimentary bottled water and soft drinks. 11:15 am – 11:45 am – Enjoy refreshing complimentary mimosas on the way to the vineyards. 11:45 pm – Welcome to King Estate Winery! One of Oregon’s premier wineries, King Estate wines have been served at White House dinners. Enjoy the breathtaking views from the hillside location while tasting some of the finest wines in the world. 1:00 pm – Enjoy the breath taking views at Sweet Cheeks Winery. A client favorite with very nice facilities – indoor, covered, and outdoor patio are all perfect spots for a picnic lunch. 2:00 pm – Silvan Ridge/Hinman Vineyards. Renowned for their Pinot Noirs, Sylvan Ridge offers a picturesque tasting room and very friendly servers. King Estate – $10 for full tasting. 11 to 5 Monday and Tuesday, 11 to 8 Wednesday to Sunday. Large, nationally renowned winery with excellent restaurant. A must see if you’ve never been. Iris Vineyards – $5 tasting fee, waived with purchase. Open Thursdays 12 to 5, Friday to Sunday 12 to 6. 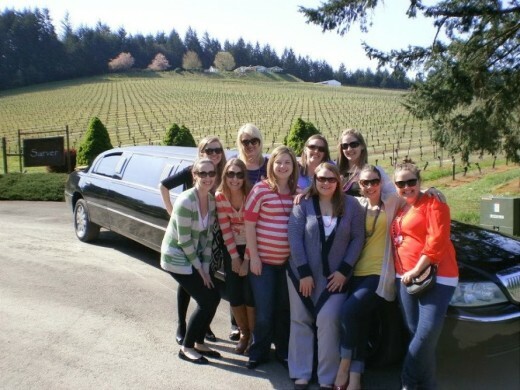 Iris opens early and offers private tastings for Sunshine Limo clients! This is a tour favorite, very friendly staff and excellent wines, great place for a picnic. Chateau Lorane – $3 tasting fee. 12 to 5 daily May through December, January through April 12 to 5 weekends only. Small “mom and pop” winery located in a beautiful setting above a private lake. Eclectic selection of unusual varietals here. Nice covered picnic area. Silvan Ridge/Hinman -$2 tasting fee. Right across the lane from Sweet Cheeks, this is one of the first wineries in Oregon. Nice selection. Indoor/outdoor picnic facilities. Noble Estate – $5 tasting fee. 12 to 5 daily. Picturesque small winery with very good Pinot Noirs. A client favorite. Nice outdoor patio for relaxing or picnic. Sarver Winery – $5 tasting fee. 12 to 6 daily, Memorial Day through Halloween. Friday – Sunday only rest of year. Beautiful location overlooking Fern Ridge and hillside vineyards. Food cart on premises. Client favorite – friendly staff in comfortable setting. Domaine Meriwether – $5 tasting fee. 11 to 4 daily. Formerly Secret House Winery, Domaine Meriwether specializes in Champagnes. Pleasant surroundings. This is a good spot to meet the winemaker, as Buzz is often your server. Pfeiffer Vineyards – $10 tasting fee for white wines, $14 for reds, includes souvenir logo glass. Special Reserve tasting $20, includes Reidel Pinot Noir logo glass. 11 to 5 daily. Client favorite and home to wines served in the White House. Nice outdoor picnic area. Benton Lane Winery – $7 tasting fee. 12 to 5 daily, January and February weekdays only 12 to 5. Very well regarded wines. Friendly staff, limited outdoor picnic area. Brigadoon Vineyards – $5 tasting fee, refunded w/purchase. 12-5 daily. Smaller family winery. Nice outdoor picnic area and chairs with view. Walnut Ridge Vineyard – $7 tasting fee. 1 – 5 Saturday and Sunday. Smaller winery. Very friendly, knowledgeable tasting room staff, good chance to meet the owner! Tasting fees may change without notice – we do our best to keep these updated but we cannot guarantee that the wineries woon’t have different fees at th time of your tour. This list of wineries goes from south – King Estate and Chateau Lorane on one end – to north – Pfeiffer and Benton Lane on the other. It’s usually best to try to visit wineries that are fairly close to each other, to minimize driving time between wineries. So a good tour might be Chateau Lorane, King Estate, Sweet Cheeks and Silvan Ridge, or Noble Estate, Sarver, Pfeiffer, and Benton Lane. The minimum time we recommend for a wine tour is 3 hours. Our most popular wine tour is 6 hours, visiting 4 wineries, usually with lunch planned along the way. We have a specialist on staff who can assist you in choosing the right itinerary for your group once you book your tour. Oregon wine tours are our most popular offering and are really an enjoyable, memorable occasion for all sorts of different get togethers. We’ll look forward to seeing you on one! All limousine reserv​ations include complimentary bottled water and soft drinks along with lots of ice. Eugene wine tour reservations also include champagne and juice for mimosas. All limos are non smoking. 20% driver’s gratuity and 7% fuel surcharge will be added to all reservations.